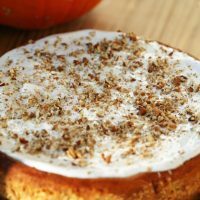 This is a delicious pumpkin cheesecake recipe that is a favorite fall dessert. 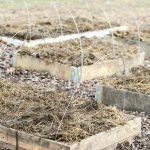 I usually make it as a dessert for Thanksgiving dinner and it always ends up being everyone’s favorite dessert! 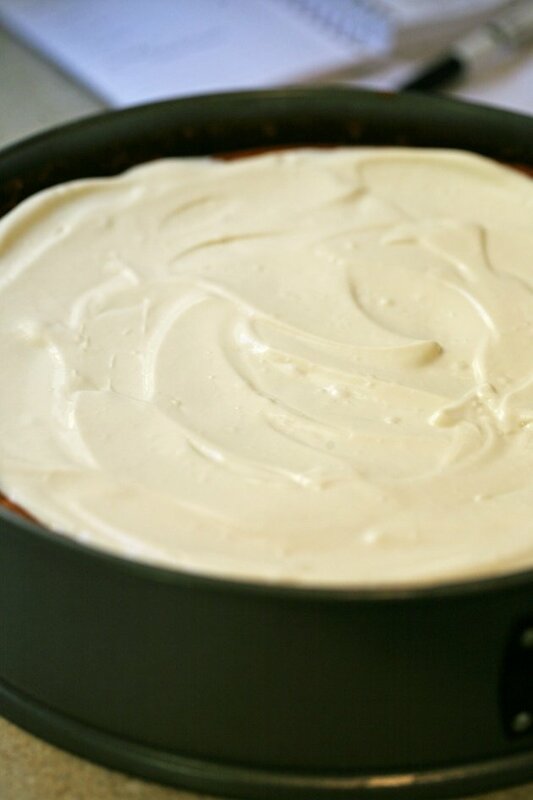 The ginger snap and pecan crust is a delicious base for this rich cheesecake. 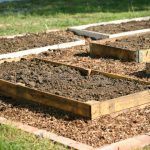 I use fresh pumpkin puree since there are so many available pumpkins in the fall. 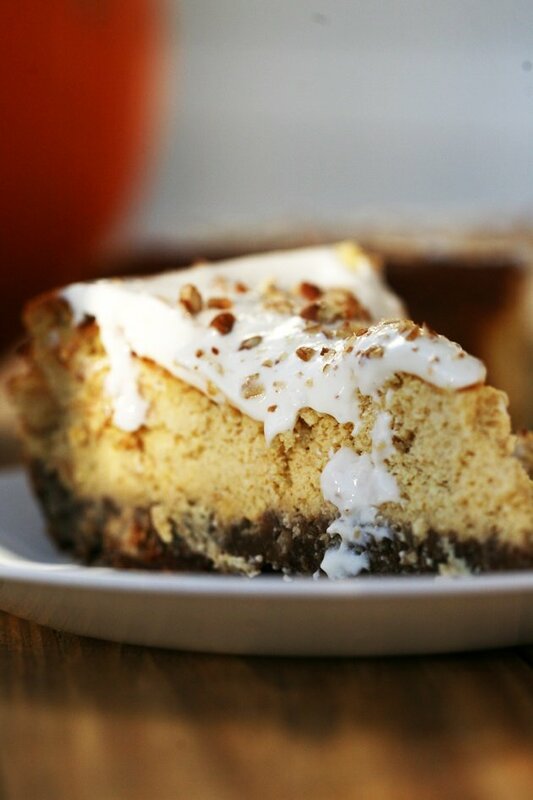 I make this pumpkin cheesecake every fall and it never lets me down. 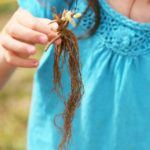 It’s not hard to make, it’s not too sweet, and it’s a great way to use some of the fresh pumpkin puree I make from the pumpkins we pick up at the patch or grow. I used to wrestle with my pumpkins in order to make a puree. Cutting the skin off was a nightmare, and trying to clean the inside of the pumpkin wasn’t too fun either. I found a much easier way to turn a fresh pumpkin into puree, you put the whole pumpkin on a baking sheet and stick it in the oven for an hour and a half (more or less) on 350F. It’s so simple and easy. The skin peels right off and it’s also much easier to clean the inside. Sometimes I can the pumpkin instead. This saves me the need to remember to take the bag out of the freezer to thaw… Something I always have a hard time doing. 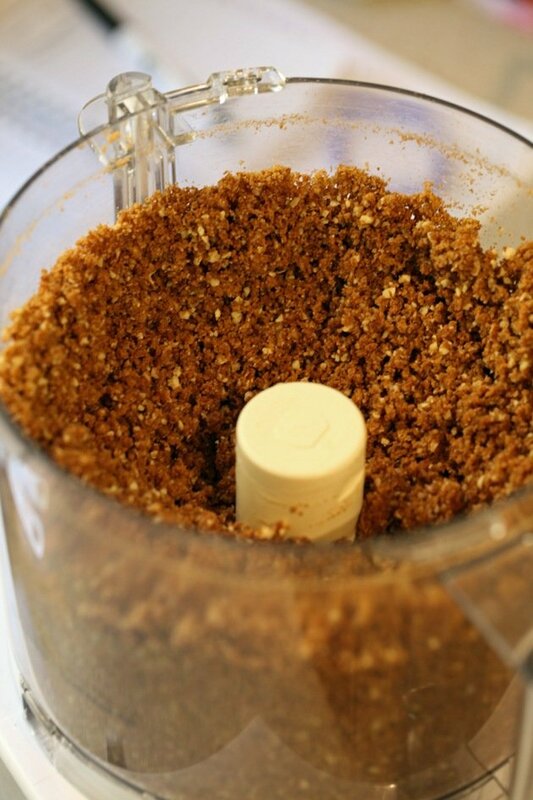 Throw in the food processor ginger snaps, pecans, and brown sugar (all the measurments are in the printable below). Pulse a few times. Until the pieces of butter are well combined. 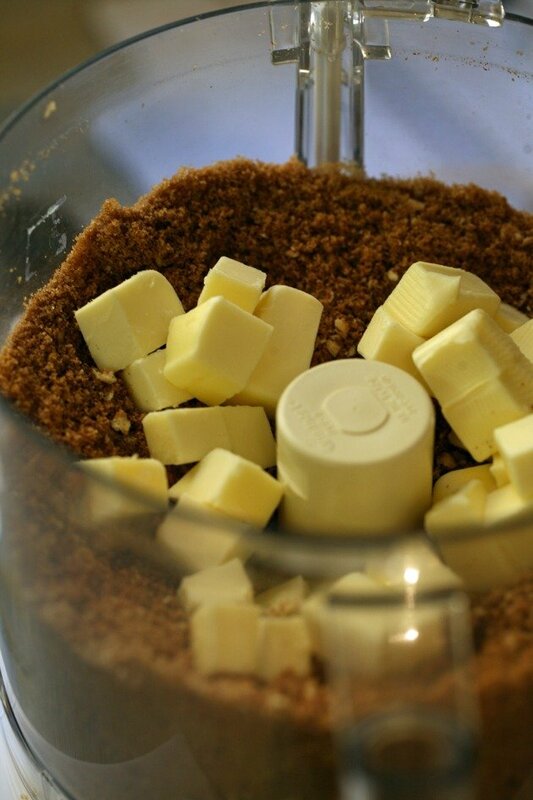 Butter a large 10” springform pan and add the crumbs. Pack them down lightly. Bake on 350F for 10 minutes. It will look pretty much the same when it comes out of the oven. Just put the crust aside and let it cool a bit. 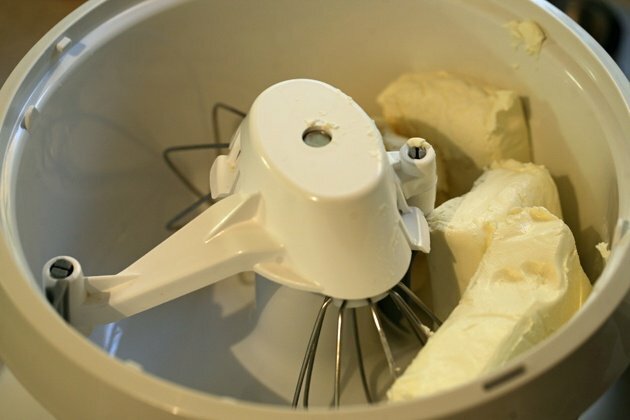 While the crust is cooling, add three packages of cream cheese, a cup of ricotta cheese, and a cup of sugar into the bowl of a mixer. It’s important that the cream cheese will be at room temperature. 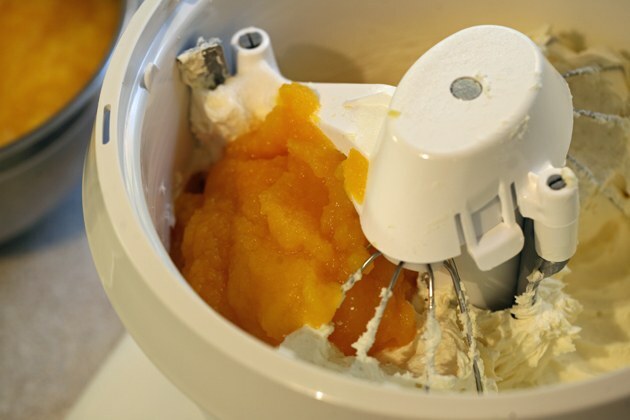 Let the mixer whip the cheese and sugar for a couple of minutes. Next, add the pumpkin puree. 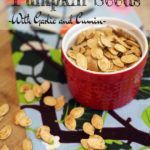 I use puree from fresh pumpkins but I’m sure you can use canned puree if you prefer. 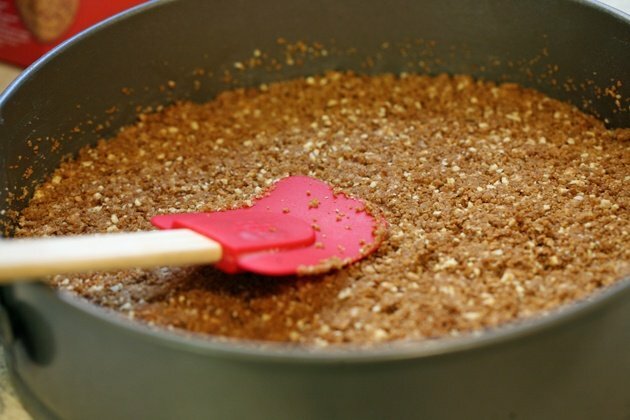 After the puree is incorporated, add in the spices: cinnamon, ground ginger, nutmeg, and salt. 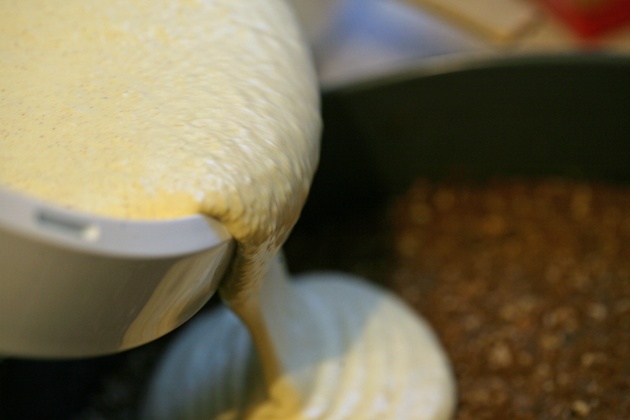 Also, add vanilla extract and a little bit of flour. 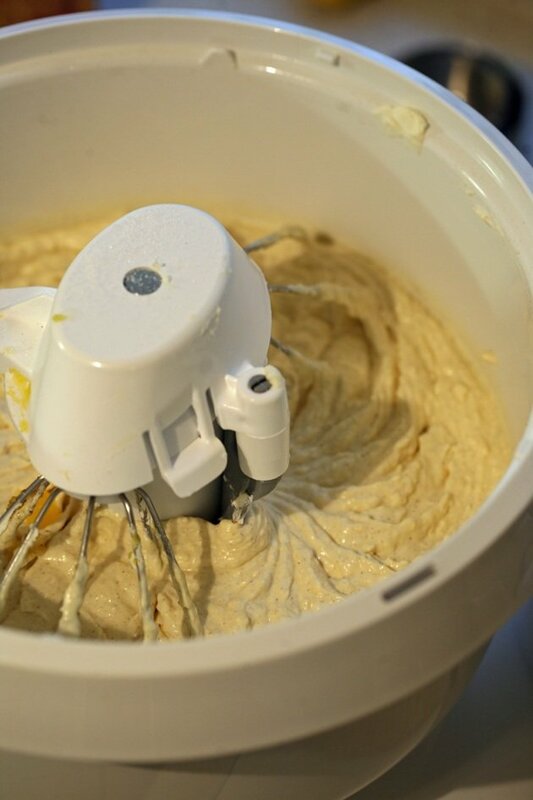 Let the mixer whip all of this goodness together for a couple of minutes. Next, we are going to add four eggs, one at a time while the mixer is working on low speed. 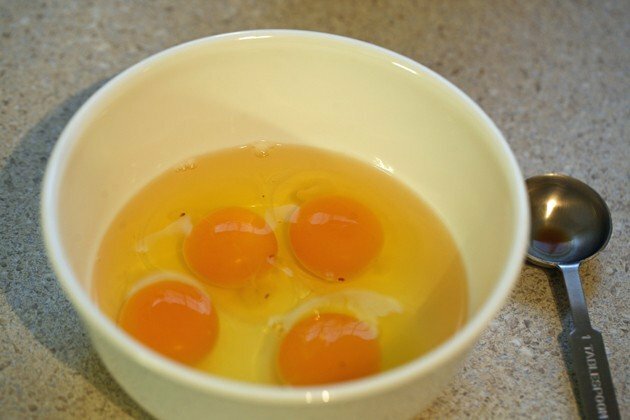 Give it a couple more minutes to mix the eggs well. Place the pan back in the oven and bake for 75 minutes. Here is how it looks when it’s out of the oven. The one bad thing about this cake is that you can’t eat it right away. It’s one of those cheesecakes you have to refrigerate for a day before you dig in. So let it completely cool on the counter and then cover it and put in the fridge for at least a night (8 hours). Don’t worry about the cracks on the top, we are going to cover them with yummy sour cream. Fast forward to the morning and the cake is now cold. 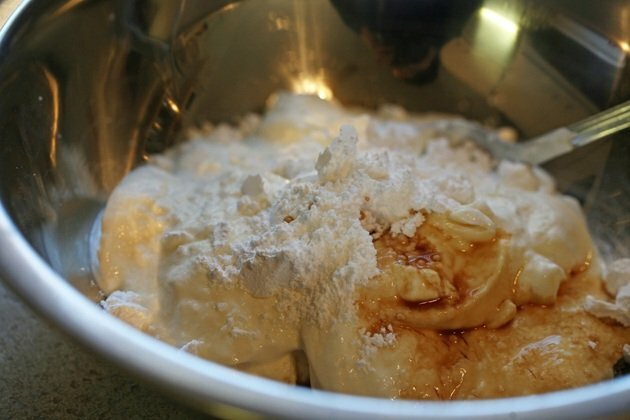 In a bowl, mix sour cream, vanilla extract, and powdered sugar. And spread it all over with a spoon. 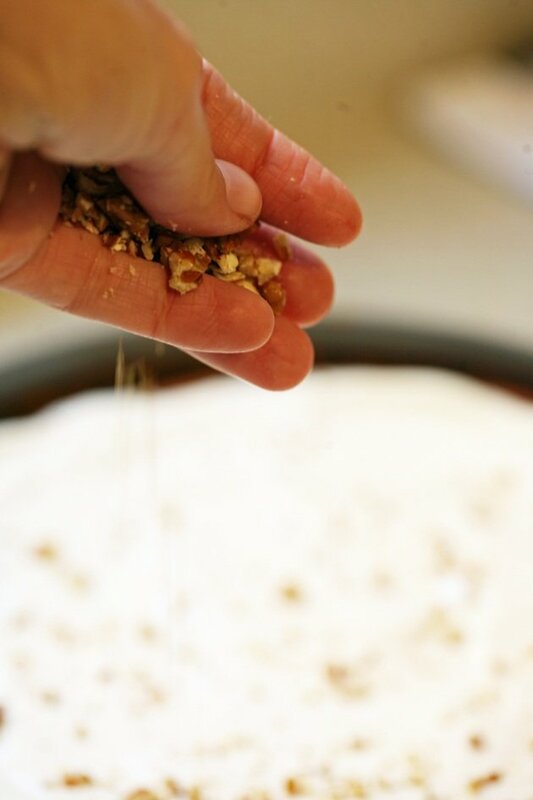 Lastly, chop some pecans and sprinkle them on top of the sour cream. 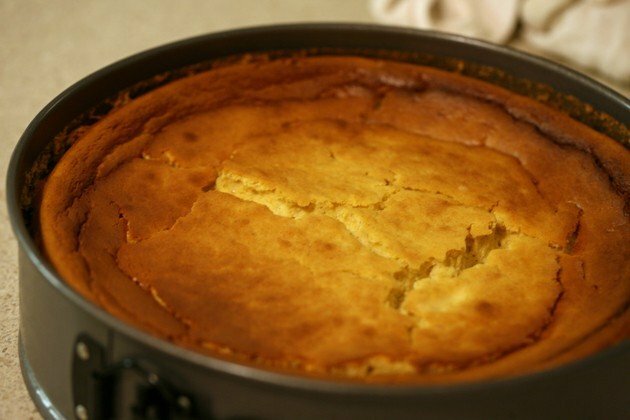 This is an awesome cake to make for Thanksgiving because you can make it the day before, even a couple of days before. This way you’ll have one less thing to cook the day of the holiday. I love that the crust is thick and the cheese mixture is so rich. The spices definitely bring the autumn aroma and mood into the house. 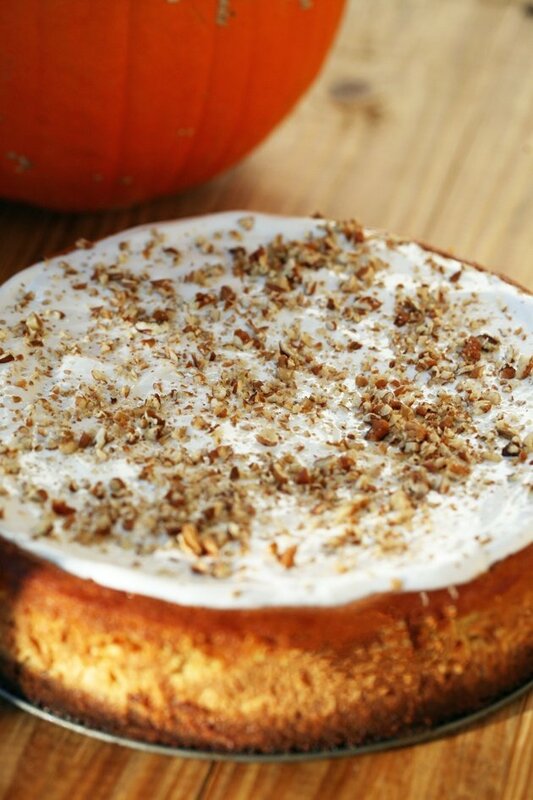 Rich and creamy pumpkin cheesecake with a delicious ginger snaps and pecan crust. 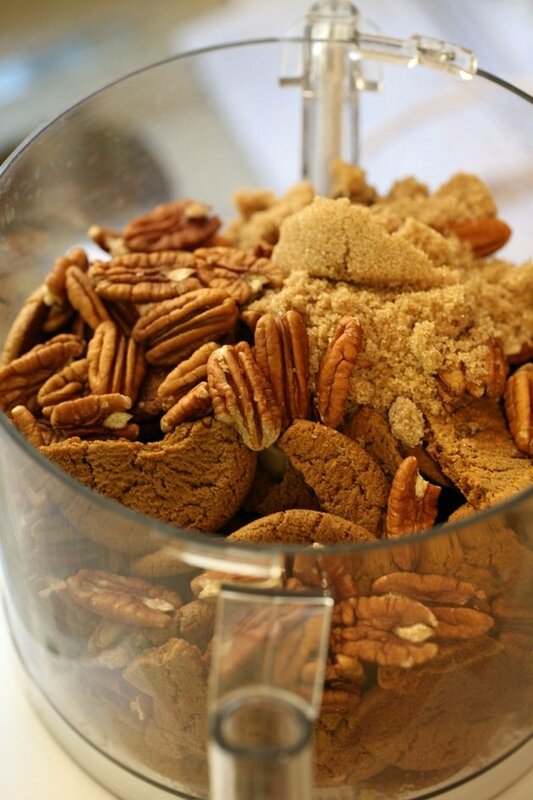 Add ginger snaps, pecans, and brown sugar into the food processor and pulse a few times. 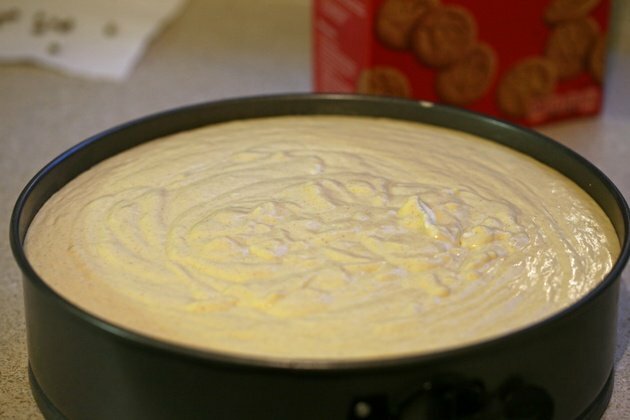 Butter a 10'' springform pan and transfer the cookie mixture to it. Pack it down a bit. Bake on 350F for 10 minutes. 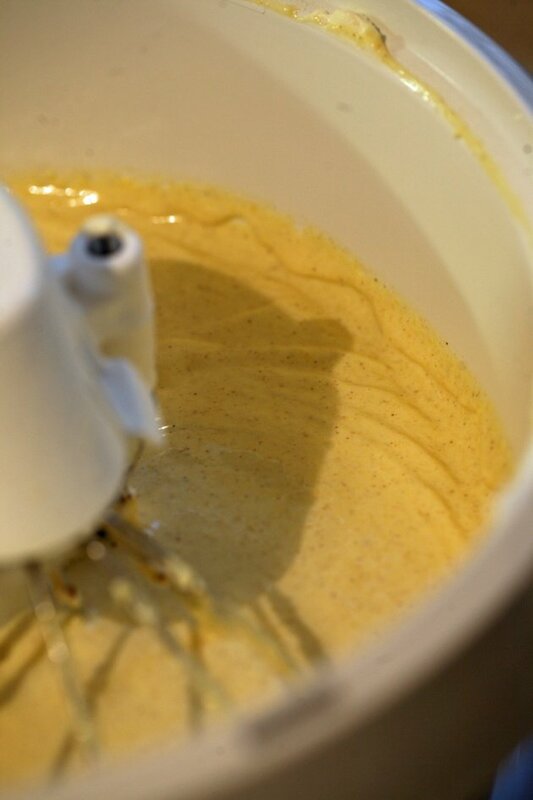 To the bowl of the mixer, add the cheese and sugar and whip for a couple of minutes. Add the pumpkin puree and whip to combine. 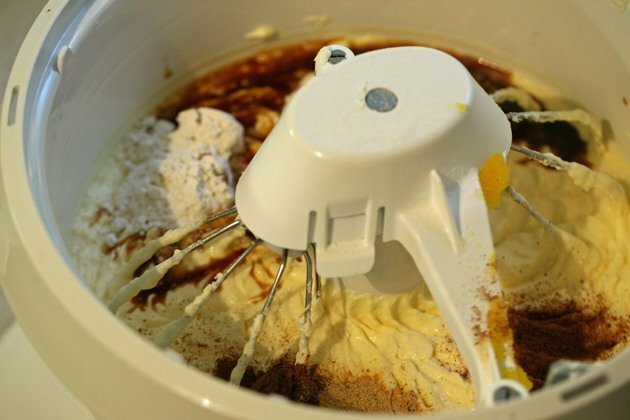 Add the spices, vanilla and flour and whip to combine. Pour cheese mixture on top of the crust and bake on 350F for 75 minutes. Set on the counter to cool completely, then place the cake in the fridge to cool overnight. 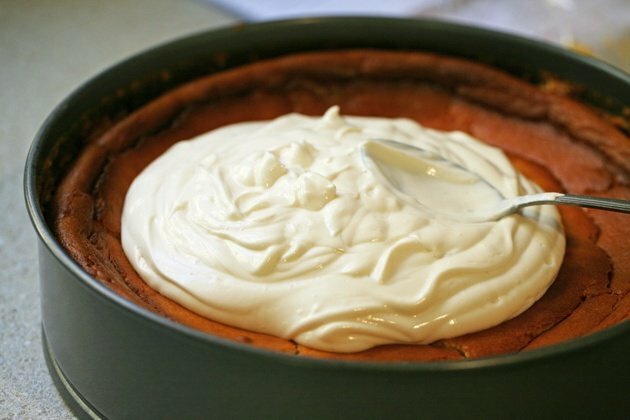 To make the topping, mix sour cream, powdered sugar, and vanilla in a bowl until well combined. 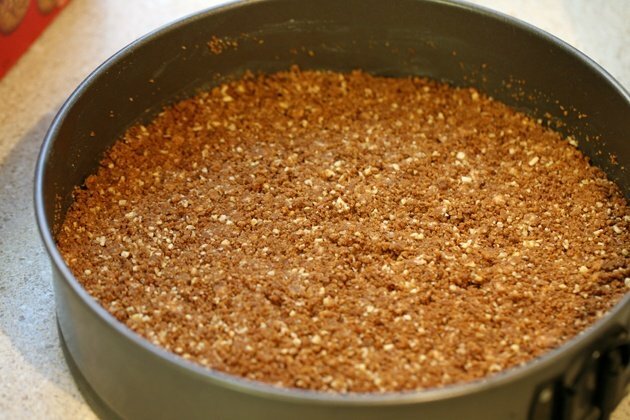 Spread over the cake and sprinkle crushed pecans on top.